Space: Wood fired oven are huge. Most are at least a metre in diameter, and often 1.5metres in depth. And remember, the lining is about 10-15cm thick. So even though the pizza oven seems so large, the inside cooking area is actually much smaller. Gas pizza ovens vary in size. The Infresco pizza oven is about 80cm in depth and width. The Gasmate pizza oven is much smaller and fits on most benchtops. Weight: Wood fired pizza ovens are extremely heavy. Most weigh about half a tonne! You need to endure that the footings of your alfresco can handle the weight (and that the earth beneath has been well compacted). Most people purchase a wood fired oven with a pre-built stand to hold it. The stand is usually constructed with a steel frame and then clad in fibre cement. A door can be inserted in the front of the cabinet so that wood can be stored inside the cabinet base. Other customers prefer to build a base in bricks. Then they place the pizza oven on top. If you get a gas pizza oven, the oven can simply be placed on top of your Outdoor Alfresco Kitchen cabinets. Access to your alfresco area: as we have discussed already, wood fired pizza ovens are massive in both in size and weight. Generally they need to be built on-site. If they are built on site it may take several days to complete the construction, as bricks and mortar must be left to dry before the pizza oven can be insulated and rendered. If you want a completed pizza oven brought to site, it may need to be craned in. Gas pizza ovens can simply be trolleyed in. Cooking time: It can take an hour or two for a wood fired pizza oven to reach the required heat. A gas pizza oven heats up in about 10-15 minutes. 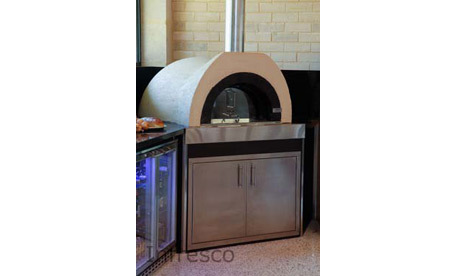 So if you want to come home and have a quick and easy meal, a gas fired pizza oven is your best choice. Cleaning– a wood fired oven is more work because you have to clear out the burnt wood. Fire regulations: Lighting a wood fired pizza oven is illegal in many parts of Australia during the summer months. Check with your local fire regulatory body.